This year, by sheer good fortune, has been filled with features marking major milestones in DC Comics history. There are a number of 75 year anniversaries among others and with this edition of the Silver Age Sage, we’re having our own little anniversary: 15 years’ worth! Yeah, can you believe it? I’ve had the pleasure and privilege of this little soapbox for 15 solid years! It’s led to so many great things along the way, too. 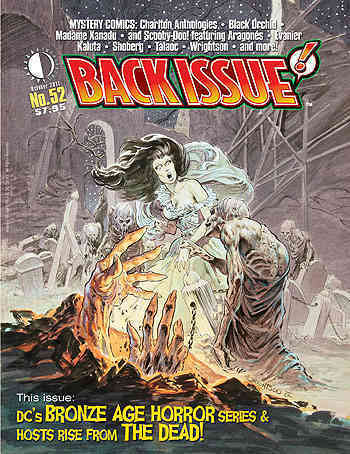 The interviews with so many wonderful creators that made the childhood of the webmaster and I colorful and fun, the opportunity to be published in BACK ISSUE and the co-author gig on Nick Cardy, Wit-Lash and the gig at Comics Bulletin and getting to meet a few of my heroes in person and of course my appearance in George Perez’s SIRENS series. I find I’m pinching myself at times. How can one ordinary guy be so lucky? So, after over 350 reviews here at the dear Silver Lantern I found myself wondering what in the world to review for this 15th anniversary. Coming up with bupkis I consulted my life long best friend and your webmaster and he had a couple of suggestions, one of which sparked an idea of something that I hope you’ll enjoy. I think it’s appropriate, too and I’ll get into that soon. 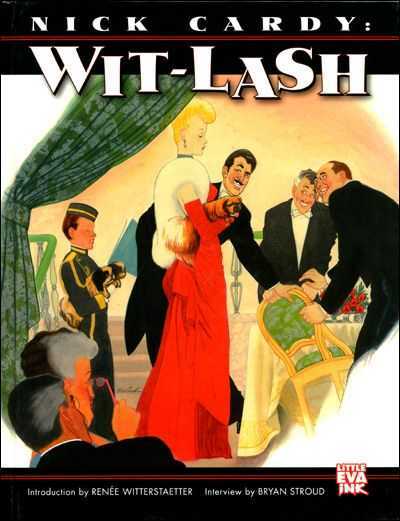 This year marks the 75th publication anniversary of another character and it had nearly slipped by me. Possibly because, to my surprise, I have a gaping hole in my collection where the hero is concerned. I can understand, to an extent. I just wasn’t much into the Big Red Cheese. The art and stories seemed a bit simplistic to me and just didn’t grab me, though I must admit I got a charge out of that issue [#276] of Superman where our favorite Kryptonian faces off against Captain Thunder, accurately described as a pastiche for Captain Marvel. 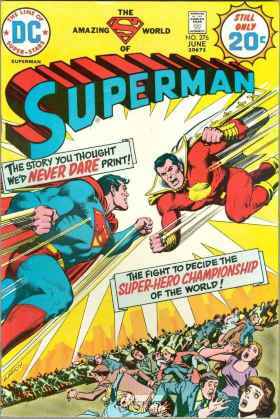 Did you know that the World’s Mightiest Mortal was handily outselling Superman (as proclaimed on several issues of Captain Marvel Adventures) back in the day? He may have been something of a, shall we say, homage of the Man of Steel, but I still think he’s unique enough on his own to not be a flagrant rip-off. In any case, after Fawcett threw in the towel during the years of litigation and DC took over on their character catalog, the biggest being, of course, Captain Marvel, aka Shazam, he and his Marvel family members were ushered into the fold at DC and Shazam! 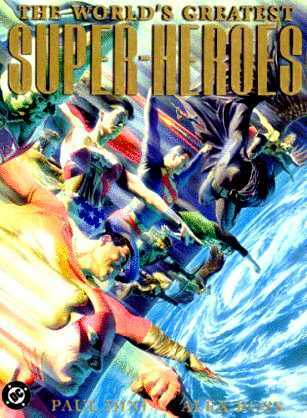 began publication in the early 70s, to very little success at the time, but the Big Red Cheese certainly deserves his place in the pantheon and to honor his 75th anniversary, I’m going to go to my very favorite version of him, by the fantastic Alex Ross. My long time readers will recall that my jumping back into comics with both feet was directly due to the webmaster introducing me to the stunning Kingdom Come [Sage #300] and Captain Marvel played a key role in the story. 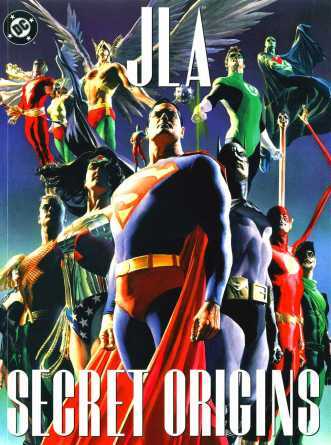 Well, I have a beautiful hardcover anthology book by Paul Dini and Alex Ross titled, “The World’s Greatest Super-Heroes,” and it collects, among other things, a series of stories featuring those heroes, including Superman, Wonder Woman, Batman and Captain Marvel in, “Shazam! Power of Hope.” That is my selection for this edition of the Silver Age Sage. The story begins with a brief origin story, told by Shazam himself of how Billy Batson, a young boy thrust into the world on his own due to cruel fate, was chosen to receive the gifts of the wizard by speaking his name, an acronym of Solomon, Hercules, Atlas, Zeus, Achilles and Mercury for wisdom, strength, stamina, power, courage and speed respectively. When “Shazam” is invoked, magical lightning strikes young Billy, transforming him into the World’s Mightiest Mortal, Captain Marvel! The Captain has not only been busy, but Billy Batson has been as well. Not only is he also Captain Marvel, but a full-time student and on-air reporter who lives alone in an apartment, conveniently signed for by a man looking remarkably like Captain Marvel in plain clothes posing as his father. As the accessible face of Captain Marvel, Billy finds himself dealing with fan mail for the Captain sent to the station and despite his desire for a little down time at a baseball game, he rummages through some letters, finding one in particular that tugs at his heart strings. It’s from Dr. Miller at Children’s City Hospital, wondering if Marvel could make a visit. Included are drawings of the hero by the children. Bolstered by the wisdom of Shazam, Captain Marvel soon pays a visit to the children in the hospital. He offers to spend a few days and to do what they’d like. He tries to begin with a game of catch with a boy in a wheelchair, but he drops the ball and turns away. 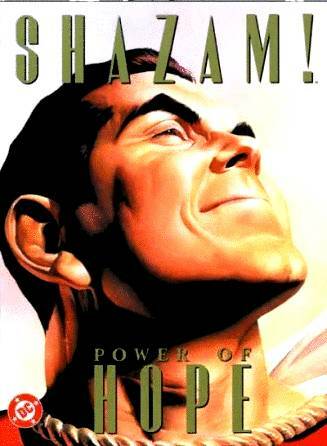 Shazam had told Marvel that he foresaw a special child in despair who would particularly need him and Batson wonders if he hasn’t discovered him. Inside, the rest of the children are overjoyed to see their hero and begin to shout out the things they’d like to do, such as a flying trip or a journey to the moon or the jungle or to help on a mission. Marvel regales them with tales of his adventures and they are enraptured with the verbal pictures he paints. There are other needs than this cheering up, though. One girl has lost her sight and can only be helped by a specialist in Japan, but she is too weak to make the journey. Determined to help, Marvel brings the mountain to Mohammed, meeting the doctor in Japan and explaining the situation. He agrees to be taken to the United States and Marvel flies him back. While the specialist goes to work, Captain Marvel takes other children for flights or to exotic locales, even creating a bubble so they can see beneath the ocean. In the midst of a trip to a National Forest, the Captain discovers a group of men blasting open a mine and causing danger through their exploits by cracking a massive dam. He puts the van carrying the children down a safe distance away to deal with the illegal activity, but by the time he trusses them up, the quick fix of boulders in the cracked dam has failed and the van is in the path of the rushing waters. Marvel gets to the vehicle just in time and instead of fear or angst encounters cheering. Feeling a bit guilty about the close call he tells Dr. Miller what had happened, while stressing that they were not endangered, but offering to cut his visit short if she feels he is causing them undue stress. She reassures him and cannot resist kissing the Captain’s cheek. He then asks about the boy who has not been responsive to him in the wheelchair. Apparently Bobby had taken a bad fall down some stairs. When Marvel approaches, Bobby is still withdrawn, but the Captain notices his injuries and can quickly see they were not from a fall, but inflicted by someone. Changing tactics, Marvel changes back to Billy Batson and the young man approaches Bobby and strikes up a conversation about baseball, weaving in a question about whether he’d been hurt playing ball. The boy grows silent, but when Billy says he had it rough at home, too, Bobby asks if Billy’s father was constantly angry as well. The next hospital visit is to intensive care, where he meets with those most ill. He visits the bedside of a little girl who beams at him, thoroughly enjoying the time, but her illness then takes her, breaking Marvel’s heart, but also giving him the feeling that he’s done some good. So there you have it. 62 beautifully painted pages that chronicle what I consider the best version of Captain Marvel you could hope to find and enjoy. What makes Captain Marvel and particularly this story special? I think it’s the triggering of what Bill Schelly so aptly described as the sense of wonder that a good comic book story can engender. Aside from Robby Reed, an old favorite of mine with his H-dial, this is the only character that comes to mind that a young boy could realistically imagine being a part of while reading the story. If you or I had managed to be chosen by the wizard Shazam, perhaps we could be Captain Marvel, too, with his great power, but childlike wonder at the world around him and yes, the humanity and the innocence within the boy, Billy Batson, who is the flip side of the good Captain. The original good guy. 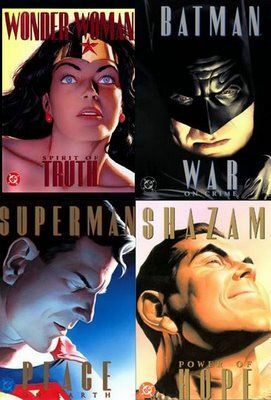 For me, this story really epitomized it, with Alex Ross’ flawless rendering of scenes and particularly expressions on the characters that really carry the story, which, like the others in the series, contain no word balloons, but only captions to help describe what’s going on, detracting nothing from Alex’s fantastic paintings. You just can’t help but feel good while reading it. 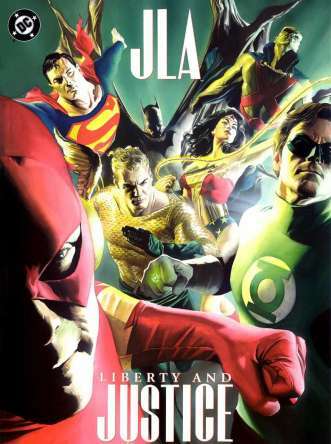 I never tire of reading these wonderful stories in this volume, also included are JLA: Secret Origins and JLA: Liberty and Justice. If you haven’t seen them, do yourself a favor and get thee to Amazon, eBay or wherever you get your fine reading material. This one deserves a special place in your personal comics’ library. For sheer enjoyment, you cannot beat it. We shall continue, hopefully for many more years to come, to bring you more reading pleasure as we explore this greatest age of comics from our friends at DC/National.